Gardening is part of the National Curriculum framework, so it's vital children understand plants. They'll cover the science in the classroom, but we suggest some fun ways to see the theory in action and get them growing (no garden or green fingers required!). Green-fingered skills are popping up in design and technology, science and geography – so why not turn a hobby into a better school report? Children of all ages will love to see the tangible results of their gardening efforts / hands-on science projects. To understand what children are taught about plants in primary school read our parents' guide. Make your own country! Fill a seed tray with a 2.5cm layer of compost, then let the kids shape the landscape. Slice the tops off carrots, swede, turnips or parsnips and plant them. Decorate 'volcano country' with stones or shells. Place on a windowsill and keep damp – the tops will soon sprout green 'lava'. Year 1: Ready, steady, sprout! Curriculum focus: Identifying plants' basic structures. The Suttons Fun to Grow range has shoots ready to eat in a week and the seeds can be planted on a windowsill (available online or from garden centres). Check twice daily with a magnifying glass. After germination, list the structures – seed case, roots, stem, leaves – then eat them! Print out a diagram of plant structures before you start, or help your child draw their own. Curriculum focus: Growing plants' need for water, light and a suitable temperature. A project for school, the garden, even a large container. Buy a hardy meadow seed mixture (Thompson & Morgan's is £3.69 for 1g and covers approximately 1m2). In March, on a weed-free sunny site, rake the soil, then water thoroughly. Mark out the outline with sand. Thinly sow the seed inside, then rake in. After germination, it needs to be watered, tended and thinned out. The first varieties should bloom by June. Others will flower next spring through to autumn, creating an ongoing project and a wildlife haven. An old florists' trick which helps children understand transpiration (the process by which water and minerals are taken in through a plant's root and transported through the stem to the other parts of the plant In order for it to grow). Slice 2cm diagonally from a white carnation stem. Place in a vase of water, which has had 10-20 drops of food colouring added. Leave 12-24 hours. As water travels up the stem, the flower petals change colour (red and blue work fastest). This is best started around February half-term in school, the garden, or a park. Decide on a manageable area and do a wildlife hunt, listing what you find, where and when. Think about how the environment could be improved – planting for insects, bird feeders, bug boxes, log stacks to provide overwintering sites. Do this monthly and see if biodiversity changes. Note negative effects, too – litter, pollution, cats! Show your child how to multiply plants by growing pelargoniums (geraniums) from cuttings. Cut a 5cm long shoot and pinch off the leaves, except for the top two. Plant the shot in damp compost, 1.5cm deep, near the edge of a 13cm clay pot (five or six will fit in the pot). Place in good light indoors. When roots poke out of the bottom, pot up individually. Abracadabra – six plants from one! Head to a local park, or use your garden. Identify 1m2 patch of land. With a magnifying glass, look for plants and insects and list the ones you find. Can you classify them according to observable characteristics, similarities and differences? For more family-friendly gardening ideas (mini wildlife ponds, cress heads and more) and learning resources, including details of the Royal Horticultural Society's Campaign for School Gardening, go to the RHS Children website. The National Children's Gardening Week website has loads of garden projects for kids, including writing your name in salad, growing garden chairs, making a robot composter and lots more! Food Growing Schools: London promotes food growing in London schools and offers a wealth of free resources for teachers (and parents) who are gardening with children. 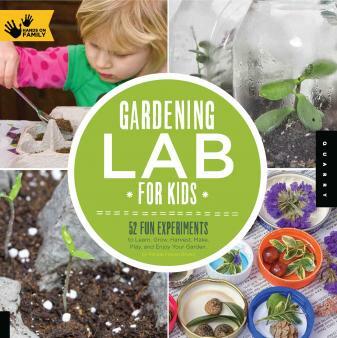 Gardening Lab for Kids: 52 Fun Experiments to Learn, Grow, Harvest, Make, Play and Enjoy your garden (£16.99, Quarry) is a brilliant handbook for green-fingered kids. Step-by-step garden projects include making a rain gauge, planting a butterfly garden and a mini pizza garden, building a pollinator palace and constructing a clay pot fountain.